During the first round of the UEM Championship Danny's Racing Team was invited to make some demo-runs. So along with a few other cars we made the trip to Kunmadaras in Hungary. This was the second year that the bikes had a championship round on this track. And Kunmadaras is actually a perfect place to become a future FIA event. The weather was nice and warm. One thing about the Hungarian spectators, they are very enthusiast about dragracing. On Friday we made one run and on Saturday and Sunday two. We had changed the engine due to the severe damage we had at the Easter Thunderball. But unfortunately we had problems with getting the power down the track in Kunmadaras. And so we didn't manage to put a good time on the boards. 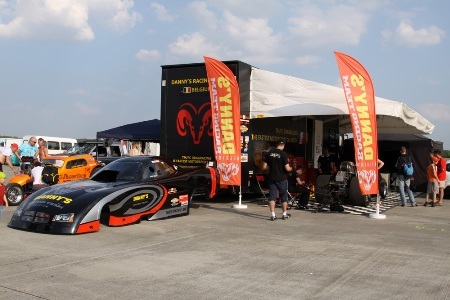 At this moment we are preparing for the Main Event in Santa Pod and we hope to be ready in time. We compete the Easter Thunderball in Santa Pod to do our first testruns and hopefully we can find a good setup for the Fia races ,who starts with the Main Event in Santa Pod UK.